Great Big Tube Overdrive-Fuzzed Tone! 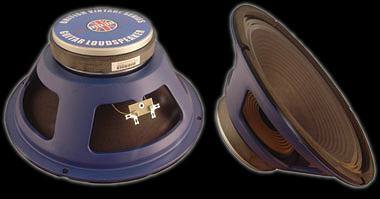 5W CLASS A ~ BIG sounding w/Monster fuzz tone at max! Roll back the clocks to 1965 visually and 1967 aurally. 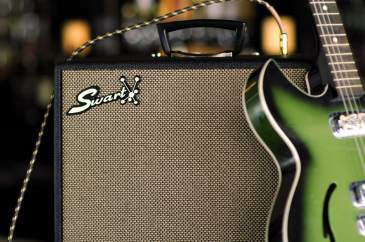 Add some of the biggest tube reverb on either side of the Mason-Dixon line. Crank that ole first chicken head knob to the right till it stops and prepare to scare yourself with the biggest, baddest fuzz tone you've ever heard. Why mess with those cleans when this sounds so damn good? To hell with chores, work, tikes, rent, that Vincent Black Shaldow you were dreaming about... Man, you're plugged into a three-dimensional Sonic Lava Lamp! Yep, Dr. Swart has done it...again. And all this before you've even even TRIED the cleans! Don't worry, they're there. Just ease that ole chicken head back a bit. 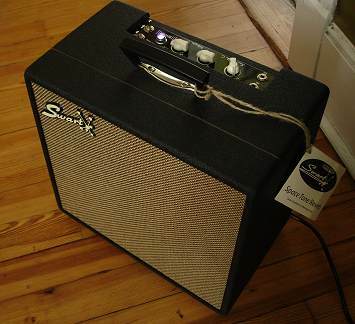 This little monster is such a blast to crank but equally at home down low where it's open, lively, with a bit of chime. But it's hard to resist bringing the volume up, though. And that 12AX7/12DW7 driven Reverb is larger than life. Introducing the Space Tone Reverb, a circuit based on the little 5W, Class A, single-ended 6V6'R that started it all but with added 60s vibe, the biggest reverb YET, all feeding into a 12" Mojo BV-30H speaker with Big Daddy Iron. I say this has the best Super Fuzz full volume breakup of them all and with that Swart tone everyone has come to love, all housed in the throwback finger jointed pine cabinet covered in retro Tolex. It's totally unique in today's market place. The ST-R really has it's own sound, apart from the other Space Tones, but still has it's heart from the little 6V6SE. But unlike the 6V6se, this beast can take a big tall EL-34 if you so desire. The over-spec'd Heyboer iron can handle it. 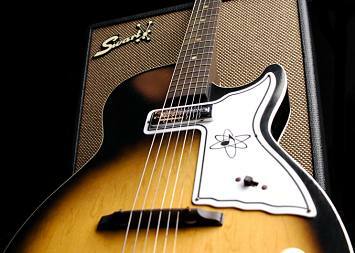 And forget any biasing headache; the ST-R is cathode "auto" biased, just like every Swart. So it's no meters and headaches - Just plug the 6V6 or any of the 6L6 family in, let her warm-up, and you're a flick of the standby away from great tone. The point to point, hand-wired ST-Reverb has three driver/preamp tubes comprised of two 12AX7s and one 12DW7 with a parallel Reverb stage utilizing the 12DW7 & 12AX7, providing the circuit with virtually zero insertion loss. 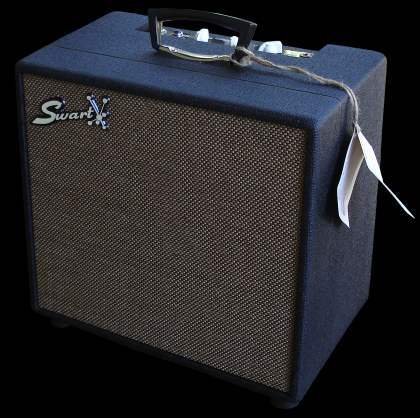 And like all Swart amplifiers, the ST-R is tube rectified by the JJ 5AR4/GZ34 for the best AC filtering bringing great compression and tone, avoiding the typical solid state harshness that seems to ride along with solid state rectification. 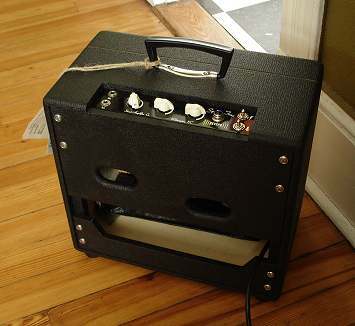 If you look at the specs above, you'll notice a lot of familiar attributes, such as cloth covered hook-up wire, carbon comp resistors, quality Mallory caps, and a circuit optimized with testing done by LISTENING....and MORE listening. Michael must have run through over nine different speaker options before settling on the Mojotone BV-30H, an excellent speaker that provides a top to bottom coherency that is integral tothe ST-Reverb sound. STR Sample MP3s by Dave Hemann! 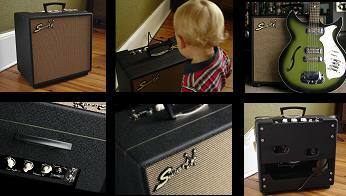 NOW SOLD OUT ~ SEE NEW STR-TWEED which can be ordered with the STR Cabinet option for $100.